By awarding this prize, we strive to help schools simplify yet another of those processes that can sometimes drive parents mad. TeacherLists, the smarter way to manage, share and find school supply lists, announces the ‘Schools Work Smarter’ sweepstakes that will award $5,000 to one school. For the chance to win, an educator, school or office administrator, or a school volunteer must upload or update their school’s 2015-2016 school supply lists on TeacherLists.com, and then add the link provided by TeacherLists to the school’s website. TeacherLists users, defined as anyone who coordinates the school supply list process at a given school, such as school secretaries, technology coordinators, school PTO and PTA volunteers, and school principals, can enter for a chance to win the award on behalf of their respective schools. A free account is required in order to create or upload supply lists but no purchase is required to enter. Users have until August 31, 2015 to complete the steps required to apply for the contest. 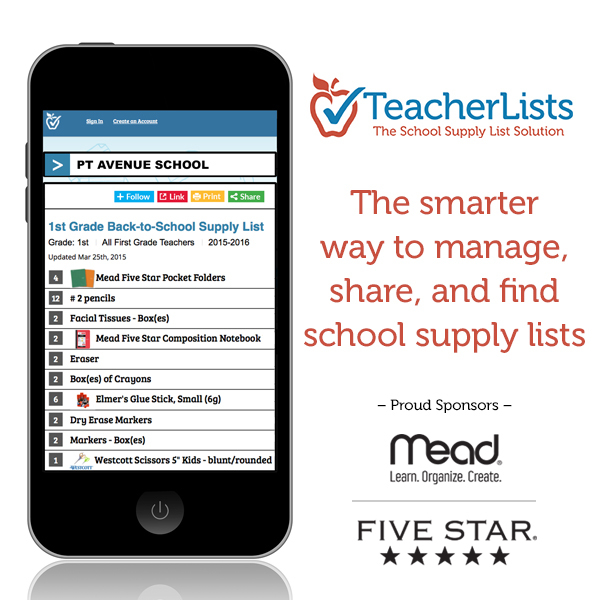 A 21st century school supply lists solution, TeacherLists provides educators and administrators a more efficient process to upload and update supply lists year-to-year and provides a mobile-friendly platform for parents to find or print the necessary lists. Free-of-charge for schools and parents, TeacherLists is web-based and easily accessed on a desktop, tablet or smartphone. To streamline the process for parents, TeacherLists is also available at select major national retailers and web properties. The online school supply lists provide parents the freedom of instantly finding and organizing the most updated school supply lists, twenty four-seven. For more information and the official rules, visit http://www.teacherlists.com/schools-work-smarter.